Hrishikesh Parthasarathy, Vice-President (Impact) at the Azim Premji Philanthropic Initiatives (APPI), talks to us about why nonprofits and philanthropies need to embrace data-driven impact management as a fundamental process to improve their decision-making. He also shares how having the right data makes it possible for relevant stakeholders in a project to not only measure the changes in their target population but also improve the effectiveness of their field interventions. Q1. Why do funders need nonprofits to manage their impact? Impact is the only way we have of articulating our investment was well spent and that it made a difference on the ground. But equally important is learning from our interventions to understand what worked and what didn’t work so that one can actually do a better job of intervening with their target population. Q2. What have been the challenges in traditional ways of measuring impact? Measuring impact is a very hard problem to solve. In terms of the development sector, it’s a fairly complex one. Things on the ground, especially in remote areas and tribal areas are very different from what you envisage because of the challenges organizations face while working in remote areas, especially tribal areas, the readiness front-line staff that they have or the nature of work that they do. At Azim Premji Philanthropic Initiatives (APPI), we work with a lot of organizations that are pen and paper-based, but it brings with it a whole lot of challenges. The first one is around data integrity and quality. The second challenge is the problem of collating and organizing this data into an efficient form that provides insight back to people who are driving the program, to help them do their job better. For this to happen, it’s really important to try to move, wherever practical, from a pen-paper based system to a system that digitally captures data. Q3. What role does data and technology play in impact management? The fundamental building block in that whole story of impact is data. Mobile-based digital data collection is a must for any organization in this sector, whether for a funder like us or a nonprofit. Data is best captured at the time work is done, at the source itself — as simple as monitoring data about actually whether the work got done, to the extent of surveying a village and having population-level data about what kind of changes happened in that population. For instance, GPS tracking of the point of data entry helps one ascertain that people were actually in the location they claim to be in where they did a particular job. Having this kind of triangulation of information really helps to understand the level of fidelity and quality a program is being executed on the ground, and that’s really important in this sector. Poornima Dore from Tata Trusts talks about building scalable systems of measuring, monitoring and tracking development initiatives with the help of data and technology. Five best practices nonprofits looking to ace their next funding grant proposal should adopt. The Azim Premji Philanthropic Initiatives (APPI) uses our data intelligence platform to measure, track and monitor their strategic programs which tackle widespread malnutrition and poor dietary diversity in Odisha, India. 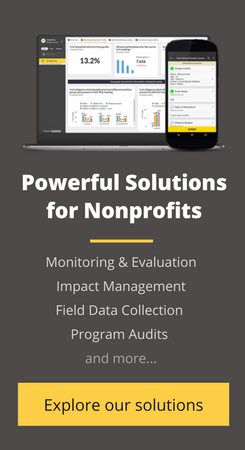 Learn more about our solutions for nonprofits here.